Good morning! I’m so happy to report that I’m back today with a BOOK REVIEW! I don’t know what got into me for most of this winter… I just couldn’t get into any books. I tried to read, but often couldn’t concentrate. Well that all changed with An Anonymous Girl, ​it was so good that I read it in less than a week and – voila! – I was back into reading again. I’d love to hear your thoughts if you’ve read any of these! This book got me into reading again! An incredibly fast-paced thriller, I was on the edge of my seat trying to figure out where the story was going. Jessica Farris is a struggling makeup artist who signs up for a psychology study to make some extra money. The study, conducted by the mysterious Dr. Shields, gets more intense and invasive as time goes on, and moves from the computer to real-life tasks that Jessica must complete. I was constantly questioning the doctor’s motives and also trying to figure out the “deep, dark secret” that Jessica is holding close to her chest. I really liked Jessica and was rooting for her thoughout, which made the book easy to read – and the ending is explosive!! I highly recommend this one, folks. Although this is technically a murder mystery, it’s not your typical thriller. I would describe it as a murder mystery (and also a love story) written in the style of ​To Kill a Mockingbird. This book hit home for me in many ways because it’s set in North Carolina, and the balmy weather on the North Carolina coast is so perfectly and vividly described, I could practically feel the salt air on my face. To preface, I LOVED THIS BOOK. The second I read the first page, it felt like an instant classic! The writing was honestly spectacular and I never wanted it to end. The story unfolds with a young Kya Clark, the so-called “Marsh Girl,” as a suspect in a murder case. Then we go back in time to when Kya was a young girl, when her mother walked away without looking back. Soon, all her siblings followed suit, leaving Kya alone with her often absent, drunk, and abusive father. She is left to care for their home, to cook, clean and take care of both of their needs, all while being judged, ridiculed and bullied by the locals. It’s a coming-of-age story, as Kya grows into a young woman, learns to care for herself, falls in love, and even gets accused of murder. This novel is a story of resiliency, survival, hope, love, loss, loneliness, prejudice, and strength. There were times where I was so happy, I cried! This book receives 5 out of 5 stars for me. I’m not going to lie, this book is AMAZING but also really ramped up my anxiety. On the one hand, it was an insanely good book and kept me up two nights in a row reading late into the night until I finished it (I finished it even faster than An Anonymous Girl). However, parts of this book are a little gory and if you dislike blood, you’ll probably find yourself skipping over small portions of the book like I did. I still think it’s worth the read, though, because I don’t know if I’ve ever read a book as exciting as this one! Darby Thorne is on her way home from college to see her sick mother, when she gets stranded by a blizzard at a highway rest stop, along with four other complete strangers. Then, she finds a little girl locked in a cage inside one of the parked cars, and realizes she’s stumbled right into the middle of a kidnapping. There is no cell reception, no telephone, no way out because of the snow, and BEST OF ALL – she doesn’t know which one of the other travelers is the kidnapper. The book forged on at a high speed from the very first page, with twist after twist, as Darby attempts to rescue the little girl. Like I said, the book was incredible (and does have a happy ending), albiet a little hard to read at times. 4. HOW NOT TO DIE, by Michael Greger, M.D. Okay so this is pretty much the opposite book as some of the others, hahah, but I’m including it because I just finished reading it for the second time. This book is far from a thriller; it’s a comprehensive book on health nutrition and actually the reason I went plant-based last year. It’s written in a way that’s easy to understand for those new to the subject, but also substantive enough that those very familiar with health and nutrition will learn a great deal of new information. Dr. Michael Greger has sifted through hundreds of thousands of studies on nutrition and compiled them all in this book, offering an unbiased and objective look at the most up-to-date science on health and nutrition. Dr. Greger presents the science and then let’s the reader decide – although it didn’t take long for me to cut out meat after reading just the first chapter. Read it and decide for yourself. This book is so inspiring and I will definitely be reading this one again! Okay guys, if you have any great book recommendations please leave them in the comments, I’m off searching for my next novel! Do you use Book of the Month? Just curious because a lot of the books you read have been offered by them! I just finished an advance copy of The Invited by Jennifer McMahon and it was amazing. I don’t typically read “ghost stories” but I would highly recommend it! Ahh yes, your book reviews are some of my favorite blogposts on here!! Definitely taking notes and I am ordering An Anonimous Girl right now haha! Honestly this could not have came at a better time!! I have been in such a reading slump! Love your book recommendations always! Thank you! Where the Crawdads Sing was SO GOOD! Absolutely a Top 5 for me out of all the books I’ve read in my entire life. If you really loved Where the Crawdads Sing, I highly suggest reading The Great Alone by Kristin Hannah. She writes about Alaska and the Pacific Northwest in a magical way and the book is full of twists and turns (also coming of age and love). Do you know about Netgalley? As a blogger, you can read books before they are released. The books are all AMAZING. I am obsessed. Check it out! I haven’t heard of this! I review books on my blog as well… I’ll have to check them out! I love romance novels, so I just read The Kiss Quotient and it was great!!! It starts off with an odd twist that leaves you wondering. Also, the Family Fang is a great one, it’s a drama/mystery and definitely kept me reading into the night to find out what was going on!!! I am waiting on An Anonymous Girl at the library right now and just bought Where the Crawdads Sing and No Exit was my BOTM book last month and I can’t wait to read them!! So glad to hear you liked them. Coool a book review! I love it! I decided to read more in english and you gave me so many idea!! I really would love to read the anonymous girl! These all sound like great books! My two favorites that I’ve read recently are The Nightingale by Kristin Hannah (a set of sisters in France during WWII) and Small Great Things by Jodi Picoult (touches on race, prejudice). Both great reads that I cannot recommend enough! Hi! Thank you so much for suggesting these books, I’ve been doing books on Audible while at work but I sooo miss actually reading a real book! (Strange, right?) I suggest Fruit of the Drunken Tree, if you do have the opportunity to read it, I hope you like it. LOVED AN ANONYMOUS GIRL, I’ll have to check out No Ext, that sounds good too. Check out ‘The Silent Patient’, it was another book I couldn’t put down and had a fun little twist ending. I just read Little Fires Everywhere (Celeste Ng) and loved it! Beautiful description writing and a plot that takes lots of interesting twists & turns. Where the Crawdads Sing is next in my list! Where the Crawdads Sing is one of the best books I’ve read. Fell in love with the story…and Dalia Owens transports you to the marsh with Kya with her beautiful writing. Hi Caitlin! Love following your blog and I live for your suggestions! I think I saw on your IG story recently something about a plant-based diet book! I’m thinking of going vegetarian soon and I would love your take/ recommendations! I absolutely loved No Exit! I just requested the others you mentioned—sounds like we have very similar taste in books 🙂 Some of my favorites I’ve read lately are: The Marsh King’s Daughter by Karen Dionne, I See You by Clare Mackintosh, and Behind Closed Doors by B.A. Paris. I love a good psychological thriller! Thanks for sharing! I love your blog and Instagram. I’m reading Breaking Cover and I highly recommend it. It’s a Ex-CIA agent memoir. Her life is the stuff of thrillers and her book details the story of the life and death stakes of a CIA agent and counter terrorism expert embedded in some of the most treacherous regions of the world. I think you would like it. Loved this!! I really want to read How Not to Die & I’ve also heard great things about Where the Crawdads Sing! Glad to hear you enjoyed them! 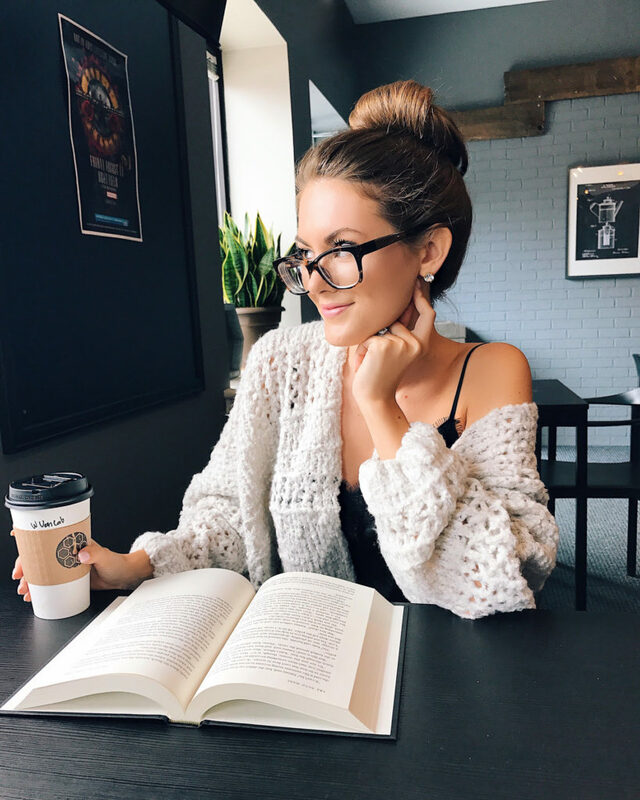 We totally have the same book interests so I love reading your book review blog posts! I’m currently reading The Stranger Beside Me (It’s about Ted Bundy and pretty creepy!) An Anonymous Girl, The Last Time I Lied, and The Outsider are next on my list! Love your suggestions! Im not sure book 2 is for me but def the other 3.I am reading an anonymous girl as we speak and love it! The Tattooist is Auschwitz was really good!! Okay, I’m putting these on my reading list right now!! I’ve been reading up a storm this year as opposed to last and I’m so excited to read more! I think I will take a closer look at #1 and #4. I myself am not a fan of brutality and blood either, but still enjoy a good thriller. Great books! If you liked An Anonymous Girl , try to check out Believe Me by JP Delaney. It kept me guesing until the end! Anonymous girl was one of those books I finished in a day! I just finished Verity by Colleen Hoover, it reminded me a lot of Rebecca but with some twists so that it’s not the same story! I also finished it in one day and recommend it! I have been needing some good book recommendations. I just finished The Break Down and The Couple Next Door this last week while on vacation. I seriously couldn’t put either of them down. I also love Behind Closed Doors! Going to order An Anonymous Girl now. Thanks for the great info! I am in such a book rut these days – and I love a good thriller. Thanks for the recommendations! omg thanks for all the suggestions! i just bought one and filled up my goodreads to read list! Hi! Thank you so much for suggesting these books, I’ve been doing books on Audible while at work but I miss actually reading a real book! (Strange, right?) I suggest Fruit of the Drunken Tree, if you do have the opportunity to read it, I hope you like it. Body Love and Girl Wash Your Face are both great! You NEED to read The Nightengale! It’s honestly one of the best books I’ve ever read. So good, that since I read through it so fast the first time, I had to read it again and loved it just as much as the first. It’s being made into a movie now. You honestly won’t regret reading this!